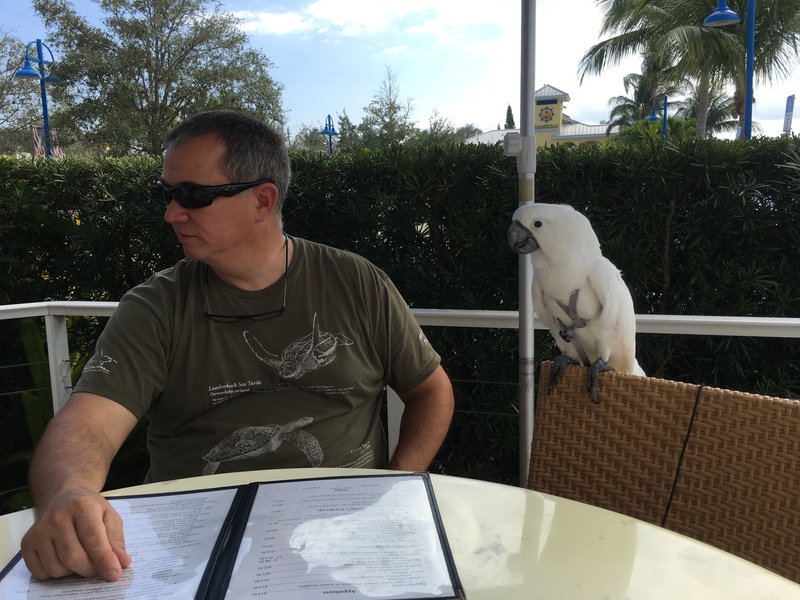 Nate and Primo had a special visitor this week while at Sunset Bay Marina in Stuart. Margo, an Umbrella Cockatoo, along whit her human friend, Michael, came over for a short visit. Margo has been in contact with us for several years as she wanted to learn about life aboard a boat in preparation for her Great Loop adventure. Nate and Primo have been telling her all about their life aboard Idyll Time. 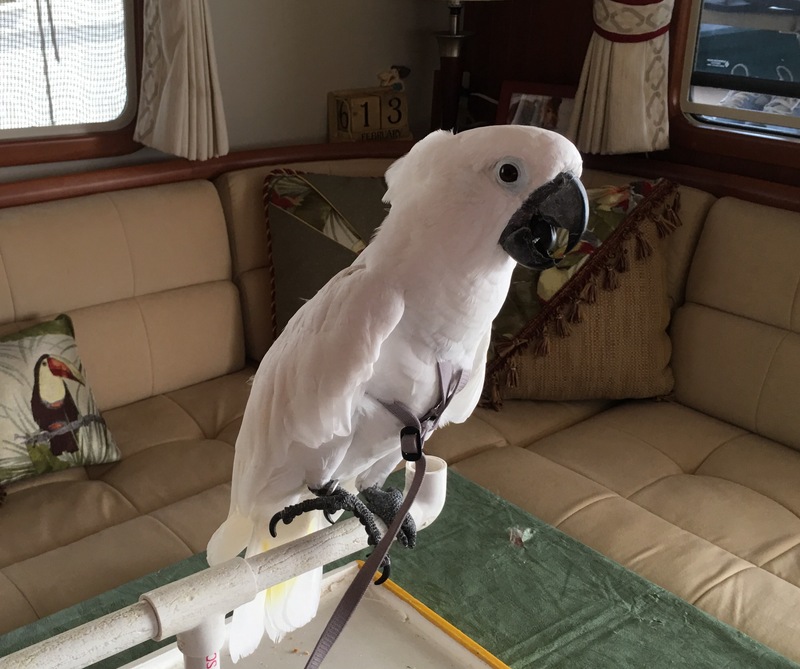 Margo and Michael are now aboard their boat in Ft. Myers and are enjoying their Loop travels. 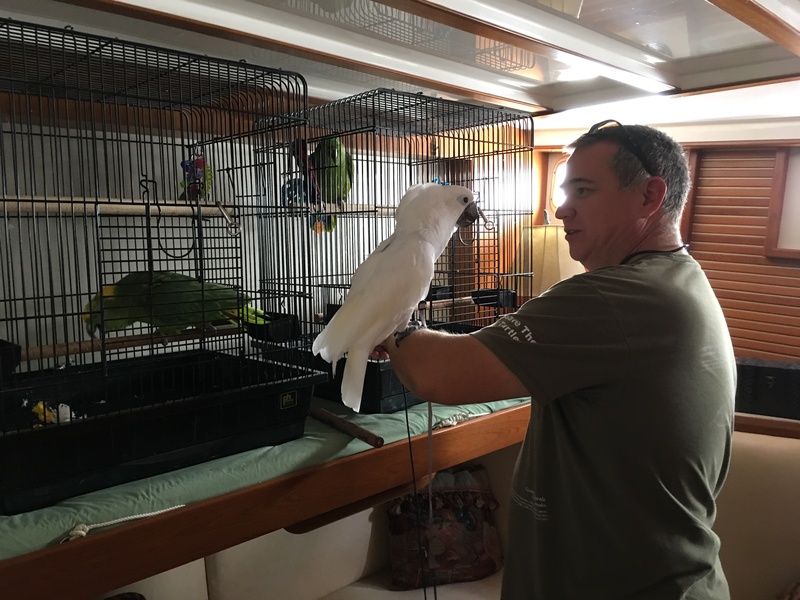 We weren’t sure how Nate and Primo would react to another bird being on their boat. All three birds seemed to enjoy the visit and were well behaved. Margo was a little hesitant about being on someone else’s boat but soon settled in and seemed right at home on Nate and Primo’s perch. Nate and Primo could take a few lessons from Margo. She is such a good bird. She wears a harness, loves to be petted, travels everywhere with Michael, and even gives kisses. She and Michael have an incredibly tight bond with one another. Margo came with us to lunch and while seated at the table received lots of visitors and attention. Michael and Margo, thank you so much for visiting with us. Maybe some of Margo’s good behavior will rub off on our two maniacs. We hope our wakes cross again in the near future. This entry was posted on February 15, 2017 at 6:40 pm. You can follow any responses to this entry through the RSS 2.0 feed. You can leave a response, or trackback from your own site.